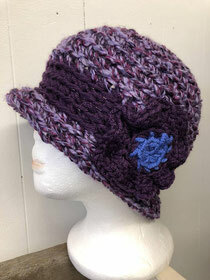 Hand-Crocheted Hats - allputtogether's JimdoPage! From the wonderfully soft, all-natural yarns that we use to our whimsical, one-of-a-kind appliques, our hand-crocheted hats truly mix fashion with warmth on any cold day. Our darling infant and toddler hats come in a variety of styles including our popular 1920s-inspired flower hats and appliqued designs such as ladybugs, bumblebees, dinosaurs, poodles, owls, sports themes, duckies, whales, hearts, octopus, Halloween and Christmas themes, mushrooms, moose and bears, to name just a few. Our adult hats are just as stylish as our children's hats, coming in a range of soft neautral colors to bold, bright shades. In addition to the designs mentioned above, we have a beautiful collection of adult cloche hats that feature oversized wool flowers, peace signs and many other designs. 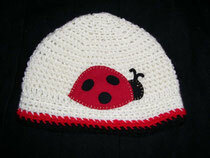 We offer the widest selection of youth and adult hats at our favorite arts and crafts festivals. Customers often spend hours rummaging through our suitcases brimming with one-of-a-kind hats! You can also purchase a selection of our hats by clicking on this link to our shop.